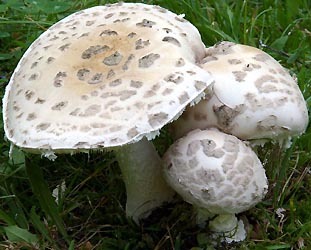 english name "European Pine Cone Lepidella"
cap The cap of Amanita strobiliformis is (50-) 70 - 150 (-220) mm wide, convex to plano-convex, sometimes with a flattened center, white to pale gray or pale brownish gray, with a nonsulcate, appendiculate margin. Thick remnants of white to pale gray or brownish gray, (sub)floccose-felted volva form crusts, patches, or coarse, shapeless, to truncate-subpyramidal warts. gills The gills are white to cream, crowded, and moderately broad. 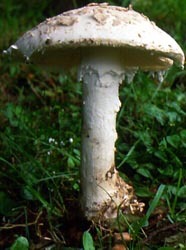 The short gills are obliquely truncate to attenuate. stem The stem is 80 - 180 (-220) × 16 - 30 (-40) mm, about equal, mostly thickset, white, flocculose, with subfloccose-felted volval remnants forming one or more ridges, or rows of rather coarse, mostly shapeless warts. An apical annulus may be present at first, but it is soft, fragile, and evanescent. The stipe has a basal bulb that can be rather large (up to 80 × 50 mm). 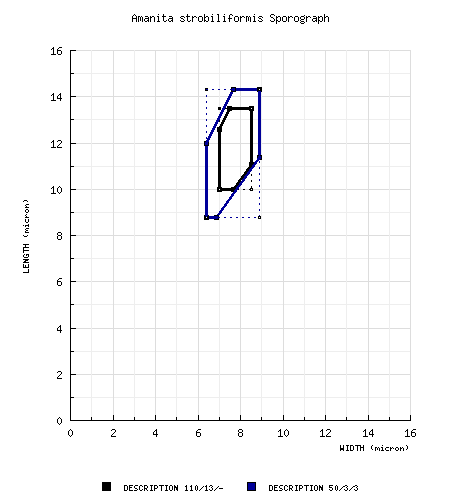 spores The spores measure 10 - 13.5 (-14.5) × 7 - 8.5 (-9.5) µm and are amyloid and ellipsoid to elongate. Clamps are absent at bases of basidia. discussion This species is known from Europe (at least as far north as England and the Netherlands) and the Mediterranean region. It was originally depicted from material that was probably French and originally described from Italy. The name has been misapplied around the world to a variety of other species. According to Borovička (2006), the species often occurs co-located with A. solitaria (Bull.:Fr.) Fr. in association with Tilia in the Czech Republic. author (Paulet ex Vitt.) Bertillon in Dechambre. 1866. Dict. Encycl. Sci. Médic. 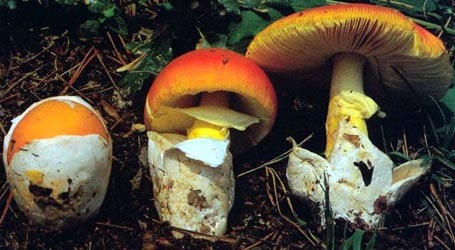 1(3): 499.
lectotypes Amanita pellita—Paulet. 1812-1835. Iconogr. Champ: pl. 156bis. Agaricus strobiliforme, Hypophyllum strobiliforme and Fungus strobilus—Paulet. 1812-1835. Iconogr. Champ. : pl 162 (fig. 1). lectotypifications Amanita pellita, Agaricus strobiliforme, Hypophyllum strobiliforme and Fungus strobilus—Bas. 1969. Persoonia 5: 519.
revisions Bas. 1969. Persoonia 5: 519, figs. 303-305. Neville and Poumarat. 1996. Doc. Mycol. 26(101): 57. The following text is largely derived from the revision of Bas (1969) except for some additions from observations of other authors (as noted) or based on original research of R. E. Tulloss and C. Rodríguez Caycedo (as noted). odor/taste Bas (1969): Odor and taste "indistinct or subraphanoid"
Neville and Poumarat (2004): "...odeur subnulle ou faible de scléroderme puis désagréable; saveur insignificante." Bas (1969): [110/13/-] 10.0 - 13.5 (-14.5) × 7.0 - 8.5 (-9.5) μm, (Q = 1.30 - 1.80; Q = 1.40 - 1.60), colorless or somewhat yellowish, thin-walled, amyloid, ellipsoid to elongate, sometimes obovoid; apiculus not described; contents refractive-guttulate; color in deposit not recorded. composite of data from all material revised by RET & CRC: [50/3/3] (8.0-) 8.8 - 14.3 (-16.0) × (4.4-) 6.4 - 8.9 (-10.8) μm, (L = 9.5 - 12.0 μm; L' = 11.4 μm; W = 7.1 - 7.9 μm; W' = 7.5 μm; Q = (1.25-) 1.28 - 1.87 (-2.07); Q = 1.34 - 1.63; Q' = 1.53), hyaline, colorless, smooth, thin-walled, amyloid, ellipsoid to (occasionally) elongate, adaxially flatted, sometimes adaxially concave, sometimes narrowed toward apex; apiculus sublateral, cyindric; contents multiguttulate to granular; color in deposit not recorded. ecology Bas (1969): "Terrestrial in woods in Europe (except northern parts); preference for deciduous woods on heavy, calcareous soil." RET: France: In ditch by road through deciduous forest with groves of Fagus and Quercus. Germany: Solitary. At 50 m elev. In slightly acidic loamy sand of mesotrophic Carpinus betulus forest. material examined Bas (1969): AUSTRIA: NIEDER ÖESTERREICH—Strassfhof-Silberwald, vi-viii.1930 Th. Cernohorsky & Wallauschek s.n. (Litsch. & Lohw., Fugi sel. exsicc. europ. 95, PR). BELGIUM: Montagne St. Pierre, 23.vi.1950 R. de Vivell s.n. (LG; L). CZECH REPUBLIC: PRAGUE—unkn. loc., 20.vi.1966 J. Durdil s.n. (PR). FRANCE: HAUTES PYRÉNÉES—St-Pé, ca. 1945 anon. s.n. (L). ITALY: TRENTINO—Trento, Gocciadoro, 23.vi.1904 G. Bresadola s.n. (S); Margone S of Trento, x.1901 J. Bresadola s.n. (S); Sopramonte W of Trento, viii.1897 Turco-Lazzari s.n. (S); Vilazzona SE of Trento, vii.1901, Turco-Lazzari s.n. (S). NETHERLANDS: GELDERLAND—Doetinchem, Slangenburg, 29.ix.1953 C. Bas 199 (L) NOORD HOLLAND—Heemskerk, s.d. anon. s.n. (L). UTRECHT—Bunnik, ca. Rhijnauwen, ix.1862 Hartsen (in herb. Oudemans (L)); Zeist, Wulperhorst, 21.ix.1925 O. F. Uffelie (in herb. Uffelie). ZEELAND—Walcheren, Zeeduin, 3.ix.1938 H. S. C. Huijsman 30 (L), 358 (L). SLOVAKIA: KRAJ JIHOMORAVSKÝ—Okres Hodonín - Žarošice, 22.vi.1942 V. Vacek s.n. (PR). U.K.: ENGLAND—Surrey - Norbury Pk., 10.x.1962 R. W. G. Dennis s.n. (L). RET: CZECH REPUBLIC: PRAGUE—Klíčova [the spelling is uncertain], 9.vii.2009 Jan Borovička BORE 42 (RET 455-4); Suchdol, Czech Republic Academy of Sciences campus, 21.vii.2009 J. Borovička BORE 41 (PRM 915787; RET 455-8). FRANCE: GIRONDE—La Brède, Château La Sauque, 20.vii.1997 Rémy LeTourneau s.n. [Francis Massart 97045] (in herb. F. Massart; RET 273-1). MAINE-ET-LOIRE—Ft. de Chandelais (Est), 29.ix.1991 Thomas s.n. (in herb. J. Mornand 9123B1, as "Amanita gracilior"; RET 276-6). VENDÉE—Forêt d’Olonne, 5.xi.1978 Lemée s.n. (in herb. Jean Mornand; RET 276-7). GERMANY: UNKN. STATE—unkn. loc. (withheld), 14.viii.2001 René K. Schumacher s.n. (RET 522-4). NETHERLANDS: ZUID HOLLAND—Huys t. Donck/Ridderkerk, 9.viii.1986 M. E. Noordeloos s.n. [C. Bas 8424] (L; RET 002-5). The two Borevička collections (BORE 41 and BORE 42) both comprise immature material; so far as we can tell, BORE 42 lacks mature basidia. We were able to find 10 spores on a section of lamella from BORE 41; these spores produced the lowest Q observed for the specimens we have reviewed to date. photo Francis Massart - (1) southern France. Dr. Jan Borovička - (3) Czech Republic. drawing Dr. C. Bas (1969) - (2) reproduced by courtesy of Persoonia, Leiden, the Netherlands. select a collection to review/add spore measurements..#783882. Th. Cernohorsky & Wallauschek, #s.n., AUSTRIA, NIEDER ÖESTERREICH, Str..#783883. R. de Vivell, #s.n., BELGIUM, Montagne State Pierre#783884. J. Durdil, #s.n., CZECH REPUBLIC, PRAGUE, unkn. loc.#783885. anon., #s.n., FRANCE, HAUTES PYRÉNÉES, St-Pé#783886. G. Bresadola, #s.n., ITALY, TRENTINO, Trento, Gocciadoro#783887. J. Bresadola, #s.n., ITALY, TRENTINO, Margone S of Trento#783888. Turco-Lazzari, #s.n., ITALY, TRENTINO, Sopramonte W of Trento#783889. Turco-Lazzari, #s.n., ITALY, TRENTINO, Vilazzona SE of Trento#783890. C. Bas, #199, NETHERLANDS, GELDERLAND, Doetinchem, Slangenburg#783891. anon., #s.n., NETHERLANDS, NOORD HOLLAND, Heemskerk#783892. #Hartsen, NETHERLANDS, UTRECHT, Bunnik, ca. Rhijnauwen#783893. O. F. Uffelie, #s.n., NETHERLANDS, UTRECHT, Zeist, Wulperhorst#783894. H. S. C. Huijsman, #30, NETHERLANDS, ZEELAND, Walcheren, Zeeduin#783895. H. S. C. Huijsman, #358, NETHERLANDS, ZEELAND, Walcheren, Zeeduin#783896. V. Vacek, #s.n., SLOVAKIA, KRAJ JIHOMORAVSKÝ, Okres Hodonín, Žaroši..#783897. R. W. G. Dennis, #s.n., U.K., ENGLAND, Surrey, Norbury Park#783898. Jan Borovička, #BORE 42=>the spelling is uncertain, CZECH REPUBLIC, PR..#783899. J. Borovička, #BORE 41, CZECH REPUBLIC, PRAGUE, Suchdol, Czech Republi..#783900. Rémy LeTourneau, #s.n.=>Francis Massart 97045, FRANCE, GIRONDE, La Br�..#783901. Ft. de Chandelais, #s.n., FRANCE, MAINE-ET-LOIRE, Ft. de Chandelais#783902. Thomas, #s.n., FRANCE, MAINE-ET-LOIRE, Ft. de Chandelais#783903. Lemée, #s.n., FRANCE, VENDÉE, Forêt d’Olonne#783904. René K. Schumacher, #s.n., GERMANY, UNKN. STATE, unkn. loc.#783905. #ENDFONT OLIVEFONT, GERMANY, UNKN. STATE, #783906. M. E. Noordeloos, #s.n.=>C. Bas 8424, NETHERLANDS, ZUID HOLLAND, Huys t..